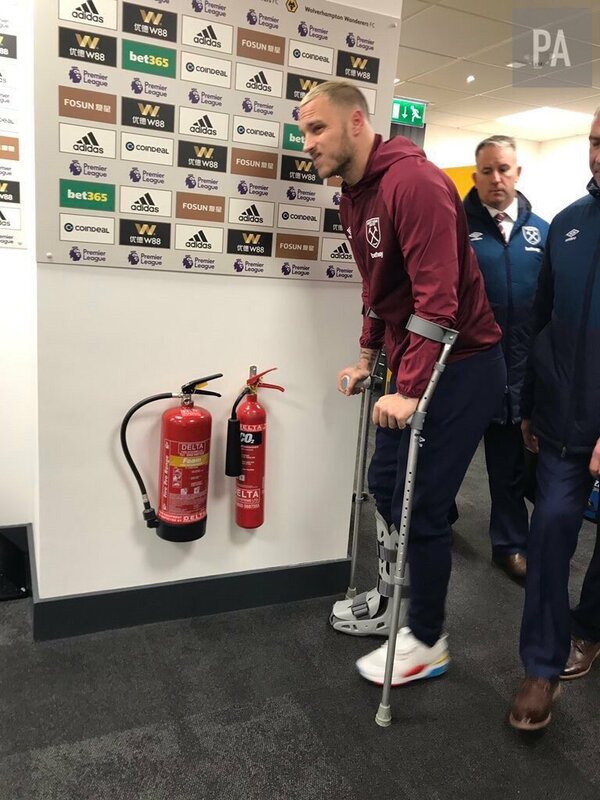 Marko Arnautovic left Molineux on crutches following West Ham's 3-0 defeat against Wolves - prompting speculation that the Austrian could be set for another spell on the sidelines. The 29-year-old forward, who recently announced he would be remaining at West Ham for the rest of the season despite being linked with a move to China was the victim of a heavy challenge which resulted in him hobbling off the field during the second half. Arnautovic's injured foot was immediately placed in a protective shield in which he left the ground, prior to being assessed by club medics in order to determine the extent of the injury. The Austrian international had barely been involved in the game prior to being substituted, despite promising supporters that he was once again fully committed to the club despite having been unable to complete a preferred move to China last week.